The device will supposedly come in both 7-inch and 8-inch screen sizes. A Microsoft Surface tablet with a smaller form-factor has been in the rumour mill for over a year now, but a recent leak by an over enthusiastic retailer on Amazon suggests that the Surface Mini is on its way. According to Tech Crunch the tablet will come in both 7-inch and 8-inch options, complementing Microsoft's current Surface tablet lineup. Microsoft's current crop of tablets come with a 10.6-inch screen size, aimed probably at filling the gap between a regular size tablet (9.7-inch iPad) and a small laptop. Sales however have never really kicked off given compatibility issues that plague the Windows RT platform. Given the situation, a smaller device could go a long way in boosting sales of the company's sluggish tablet lineup, especially considering how popular devices like Apple's iPad Mini have become. Now that Microsoft is pledging to be a mobile-first company, it really is only a matter of time before it enters the mini tablet market. The elecronics vendor on Amazon has posted two listings of cases for the rumoured devices. Both listings show what is supposedly the Microsoft Surface Mini clad in a 'Smart Cover' and a 'Bluetooth Keyboard Cover'. 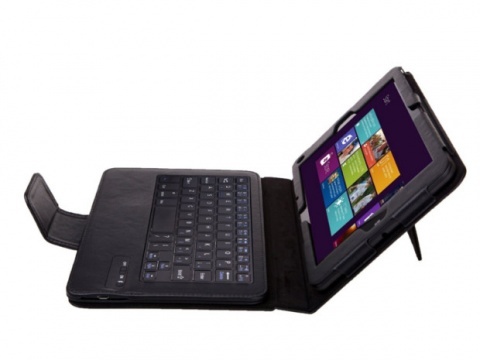 The listing also mentions that the bluetooth keyboard cover will only fit the 8-inch Surface Mini. The Amazon retailer also says that both cases will be in stock on May 18, presumably giving us a timeline within which the Surface Mini could be launched. While there has been no official word that suggests the device is on its way, we'd say even if the leaks are fake, it won't be long before we see a Microsoft Surface Mini.